International Standards for Phytosanitary Measures was developed by IPPC, International Plant protection Convention, to address the need to treat wood materials of a thickness greater than 6mm, used to ship products between countries. The process of heat treating the wood or wooden pallets until its core reaches 56 degree centigrade for at least 30 minutes, the main purpose to prevent the spread of disease and insects such as the Asian long-horn beetle and Pine wood Nematode. At Pine Products Limited we have on site, purpose built Heat Treatment facilities, ensuring pallets required for the export of goods can be manufactured and heat treated in a timely manner. 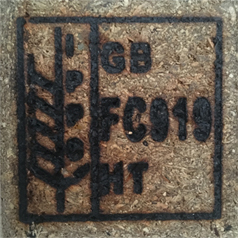 Each pallet treated will display the ISPM 15 stamp along with our Company’s registration number. The Company is audited every six months by the Forestry Commission to ensure strict compliance; a copy of our registration certificate is available upon request.